Sweet Pongal based on Rice or Millets is a staple dish during festivals in South India. Similarly, Thean Thenai Maavu is also another staple dish during festival days especially in Tamil Nadu. 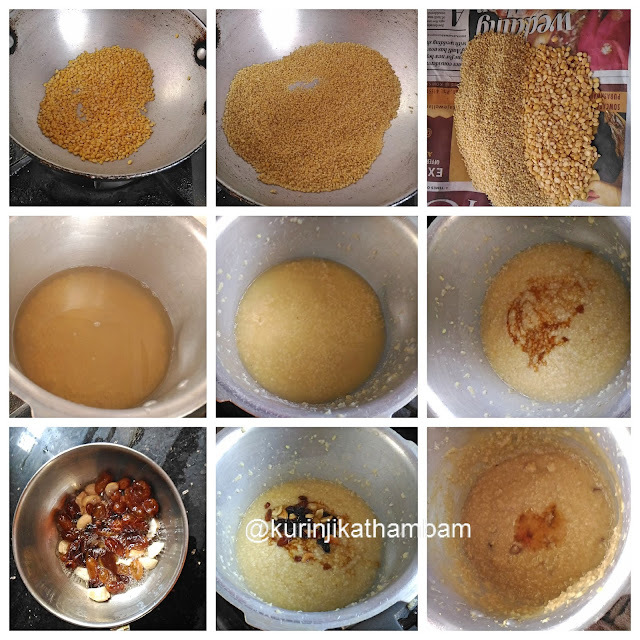 I tried mixing Thean with Pongal and created this recipe which uses Thean and Jaggery. The dish came out well and people were not able to tell the difference at all. 1. Dry roast the moong dal till the nice aroma comes out. Allow it to cool down completely. 2. Dry roast the foxtail millet / thinai rice for 2 mins or get really hot. Allow it to cool down completely. 3. Mix the foxtail millet rice and moong dal together and wash them twice. Then soak it in 2 cups of water for 10 to 15 mins. 4. In a pressure cooker, add the rice, moong dal mixture and salt with 3 1/2 cups of water (add soaked water also). 5. Pressure cook for 1 whistle in high flame and keep the flame in simmer and cook for 10 more mins. 6. After pressure has gone, add the jaggery syrup and honey. Mix them well. 7. Meanwhile, heat the ghee in a small pan. Add cashew nuts and dry grapes. Sauté till they become golden color. 8. Temper the pongal with fried nuts. Mix them well and transfer it into a serving bowl or hot box. Serve it immediately or hot. Really yummy and tasty Thean thinai pongal is ready. 3. Adjust the jaggery and honey level according to your taste. 4. Adjust the nuts level as per your choice. 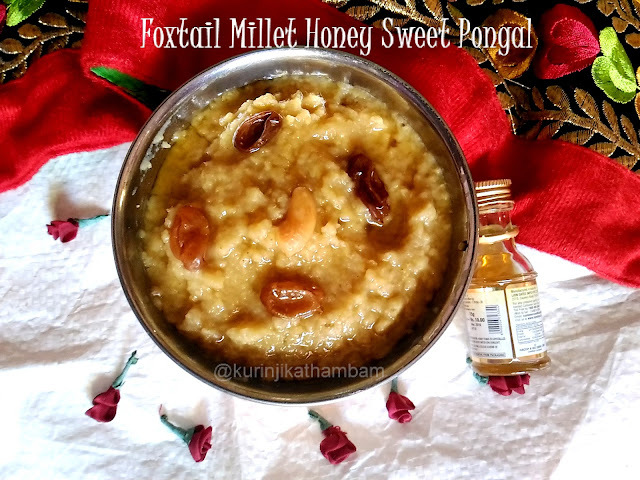 Click here for more Pongal Recipes.